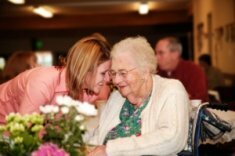 Senior birthday toasts should pay homage to the wisdom of an elderly person while honoring their role in the family and community. After someone has passed the age of 70, parties celebrating their landmark birthdays should offer some recognition with a toast, speech or special note. Your senior birthday toasts should come from the heart. Emotion is fine because, at their age, the honorees know that holding back tears or significant pauses are the signs of reflections on a cherished relationship. And while all birthday celebrations should have some humor, be sure that your humor is in good taste and will not offend or hurt the feelings of the person being honored or other older guests. Because it's a fact of life that the older one gets, the harder it is to find humor in jokes that poke fun at the realities of aging. Below are some ideas for paying tribute to those whose advanced years have given them wisdom and insight. You can use these as toasts, comments in a special speech or as notes that your close friend can read and treasure later. You might also consider adapting some foreign expressions from other cultures as part of your toast. To a lady those true beauty is enriched with each passing year. Happy Birthday. Here’s to a person who knows that real beauty springs from the heart, that good character is life's best currency, and that love is meant to be shared. Born on Sunday -- You will never know want. Count your age with friends instead of with years. The generation gap is the one war in which everybody changes sides. The rich person is not one who possesses much. The rich person is one who is content with what he has.